Not to be confused with the plant, it is also called Rambutan. The Loganberry is native to Indonesia and Malaysia and grows naturally in Thailand, Vietnam, the Philippines, and elsewhere in Southeast Asia, The name rambutan is derived from the Malay/Indonesian word rambutan, meaning “hairy”, a reference to the numerous hairy protuberances of the fruit. Loganberry wood is a wonderfully warm rich golden tan with darker reddish streaks. It has a curl and shimmer like fine maple made better by its rich warm color. I did a bunch of research before buying these, since I knew the dice would be “working dice” that live in my dice bag. Rambutan, as it turns out, is nicely suited for dice. The wood is very hard and dense, so the dice will stand up to tabletop abuse and have a nice, weighty feel in your hand. Mine are actually dense enough that they’ll sink in water. While not as impressive as some more expensive woods, it looks good, with a nice color, grain patterns, and shimmer after finishing. 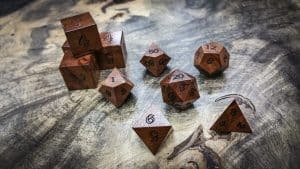 All in all, it’s a good choice for an unusual set of dice that will still stand up to real use. I would recommend getting the numbers with an infill, raster fill, or inlay, however; the grain is dark enough that a simple outline can be hard to read at a glance.